By examining neuronal activity across the PFC and Basal Ganglia in animal models of learning, we hope to elucidate the neural basis of rapid behavioral adaptation and decision making. Specifically, we are interested in the ability to attribute causality to particular outcomes (credit assignment), the specific contributions of different divisions of the PFC to feedback-driven learning, and the informational content of the corticostriatal projection. 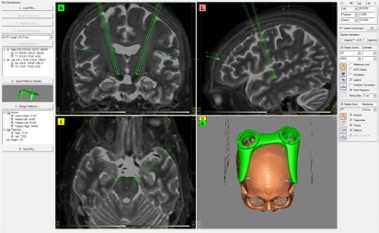 Trajectory planning combining CT and MRI to target caudate nucleus and SNc. 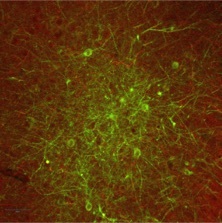 Optogenetics allows precisely-timed, cell-type specific activation or inactivation through the application of light. 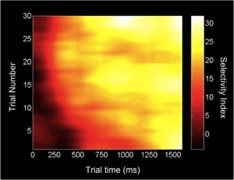 Using this technique, we are studying how the expression of particular oscillations at specific times during learning may be necessary for adaptive behavior. In addition, with the help of our collaborator, Miguel Sena-Esteves at UMass, we are testing new viruses to be applied in higher-level studies of learning. Histology to assess expression of ChR2 in neural tissue. The VIM nucleus of the thalamus is the link between the cerebellum and motor cortex. During routine, awake deep brain stimulation (DBS) surgery for essential tremor, we have the opportunity to study neuronal activity in this region, along with electrocorticography over the somatomotor cortex, to understand how this pathway contributes to motor performance and motor learning. In addition, with our collaborator, Stephanie Jones, we’re devising new patterns of DBS to hopefully alleviate some of the motor side effects of VIM DBS. 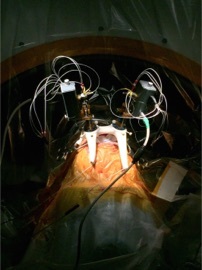 Simultaneous bilateral DBS electrode placement using patient-customized, 3D-printed stereotactic platform (FHC), within an intra-operative CT.
Parkinson’s Disease is the most common indication for deep brain stimulation (DBS) and, world-wide, well over 100,000 patients have undergone this procedure. Yet DBS remains a fairly simple therapy in which continuous stimulation is delivered to the STN or GPi without regard to behavioral or brain states (i.e., “open-loop”), potentially contributing to side effects and battery inefficiency. By recording neuronal activity in these structures, along with electrocorticography over relevant parts of the somatomotor cortex, we are learning how neural activity in these areas reflects real-time variations in motor behavior as assessed in naturalistic, continuous motor tasks. We are using this knowledge to identify and test targets for closed-loop DBS. 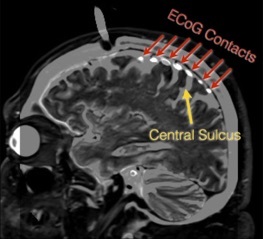 Confirmation of ECoG recording locations using intra-op CT registered to pre-op MRI. While the effects of deep brain stimulation on motor symptoms are well-characterized, the non-motor effects of DBS, as well as the more subtle effects of DBS on motor learning, are relatively poorly understood. By testing patients with DBS on structured psychophysical cognitive and motor learning tasks with and without active stimulation, we are able to assess the effect of DBS on decision-making and learning. 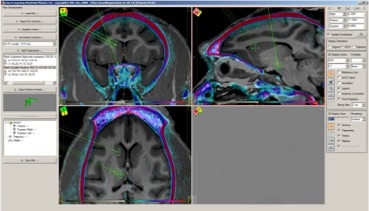 Pre-surgical DBS planning to target STN. Patients with movement disorders, such as Parkinson’s Disease, are known to exhibit deficits in various neuropsychological tasks, but the precise contributions of different cognitive and motor derangements to these deficits are largely unknown. By administering computer-based versions of these tasks and simultaneously tracking eye-movements, we are beginning to disentangle the roles of visual attention and visual search in these behavioral settings. Multi-microdrive array. More recently, we’ve switched to using Gray Matter arrays. With our collaborators, Michael Frank and Jim Cavanagh, we’re studying how the subthalamic nucleus modulates decision thresholds during a conflict and evidence accumulation task. Learning-related activity in the dorsolateral PFC. Unlike EKG telemetry in the cardiac ICU, patients in Neuro ICUs rarely undergo any form of continuous neuro-telemetry. Rather, neurologic function is assessed intermittently through provacative physical examination or through even sparser serial neuroimaging. Furthermore, the vast preponderance of data collected through various physiological monitors (EKG, pulse oximetry, blood pressure, perhaps ICP, etc.) is only cursorily analyzed before being discarded. We are developing an open-source multi-modal data acquisition system to synthesize these data and synchronize them to continuous EEG as well as near-infrared spectroscopy (NIRS). Our goal is for this platform to catalyze more fluid and rapid hypothesis testing as well as to leverage machine learning approaches to “big data” analysis. These, in turn, will generate a deeper understanding of these signals and foster more informative visualizations for event prediction and real-time decision-making. 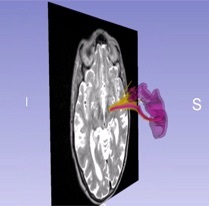 Visual-evoked activity in human VIM thalamus. We are developing an iOS app that collects motor-related data to quantify symptom severity in movement disorders, to be distributed via ResearchKit. The influence of deep brain stimulation on axonal tracts is likely at least as important as its effect on cell bodies in specific targets. Probabilistic tractography can be used to identify these pathways and understand their relationships with recorded neurophysiological signals and the effects of DBS at various sites. Idenitifcation of the hyperdirect pathway using MRI tractograpy. Using both the local and national trauma databases, we have been examining categorical aspects of brain injury in relation to short-term outcomes. 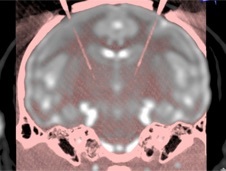 Additional examinination and quantification of radiological findings in TBI (in our local database, where these data are available) is also revealing how particular types and patterns of TBI relate to outcomes. Intra-op confirmation of cannulae positions (in collaboration with Miguel Sena-Esteves). MonkeyLogic is software we initially developed for stimulus presentation and behavioral monitoring in systems neuroscience. Now, it is used by dozens of labs and has an active user community. We’re involved in further developing this software, and expanding its use across a wider range of experimental settings.